(2008). Phase Inversion in a Batch Liquid – Liquid Stirred System. Iranian Journal of Chemical Engineering(IJChE), 5(2), 55-63.
. "Phase Inversion in a Batch Liquid – Liquid Stirred System". 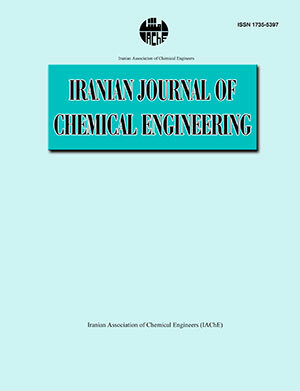 Iranian Journal of Chemical Engineering(IJChE), 5, 2, 2008, 55-63. (2008). 'Phase Inversion in a Batch Liquid – Liquid Stirred System', Iranian Journal of Chemical Engineering(IJChE), 5(2), pp. 55-63. Phase Inversion in a Batch Liquid – Liquid Stirred System. Iranian Journal of Chemical Engineering(IJChE), 2008; 5(2): 55-63. "> Phase inversion phenomenon occurs in many industrial processes including liquidliquid dispersions. Some parameters such as energy input or the presence of mineral compounds in the system affect this phenomenon. The aim of this research is to study the speed of rotation or energy input at a range of 400 to 800 rpm in a batch liquid-liquid system containing toluene and water. The presence of sodium chloride and magnesium sulphate in the system was also studied. It was shown that the increase of energy input had a more obvious effect on oil in water (O/W ) dispersion at lower values of holdup. It was also shown that the ambivalence (o/w → w/o) region of the phase inversion curve shifted downward and became wider as a result of the decrease in interfacial tension. It was observed that inorganic salt, used in both single and dual (mixed) shapes, enhanced phase inversion for O/W dispersion. Therefore, the greater the ionic strength of salt, the greater the tendency to phase inversion is.